When Should I Archive or Delete my Donation Form? Over time, you may create any number of donation forms to use with Virtuous Giving. At some point, you may have to clear out some of your older donation forms to keep them from cluttering up the place. From the main Forms screen, you can click on the Actions button to the right of any form to bring up a menu or options. Clicking Edit will take you into the form builder, and duplicate will allow you to quickly create a new copy of any form. The big question when removing forms, though, is regarding the last two options. When to use Archive and when to use Delete? Generally speaking, when in doubt, it's best to Archive. Choosing to Archive a form will preserve the code; if it is still in use on any page of your site (maybe even on a page you've forgotten about), the form will not "break" the page. Visitors to that page will see a message letting them know that the form is no longer available. In some cases, you may wish to use delete instead. 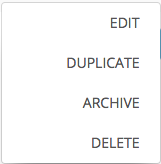 Use this option to remove any form that you may have started working on, but never published or used on your website. Be aware that deleting will break the embed code used to post this form to any web page; visitors to that page will receive an error. If a form has been published, or if you are not sure, it's likely better to archive instead. If you have created the form and you are sure it hasn't been embedded anywhere, then you may choose to delete. To delete a form, you will be required to type in the actual name of the form to be deleted, as a way to avoid accidental deletions.